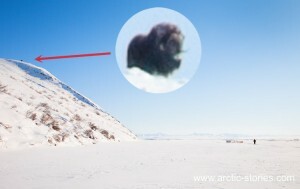 Pam – Hi, I went out tracking this morning after Nemo the blizzard, and found a track like the one you have at the bottom of the Arctic Animal Tracks page – you mention that you didn’t know what the tracks belonged to for a long time. The large prints in my set are about 3.7″ wide and 4.4″ long, and the small prints are about 2.8″ wide and 2.6″ long. They are in the exact same arrangement as yours, and seem to have four toes on each print. The straddle is about 11″ and I think the leap is about 12″. I’m going to continue searching for an identification, but am hoping you might help me out by sharing yours. I live in Maine, by the way. 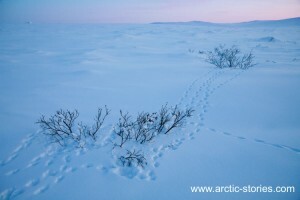 I believe the tracks are from a snowshoe hare, the big paw prints at the front are in fact made by the hind legs and the little prints at the back are the front legs – makes sense if you think of how they run. Enjoy the snow!